We are proud again to have received New York Governor Andrew M. Cuomo’s Support for the Street festival on 7/14/2018. It is a pleasure to send greetings to everyone gathered for the third annual Go Africa Harlem Street Festival, celebrating the history, legacy, and significance of African culture throughout the vibrant Harlem community. the opportunity to experience the best of your community in a display of goods and services by local merchants, inspired by the African culture that is a foundation of Harlem life. Go Africa Network Inc. for once again bringing this event into the heart of Harlem, adding positively to the dynamics of summer life for its people. Warmest regards and best wishes for a successful and grand street festival. 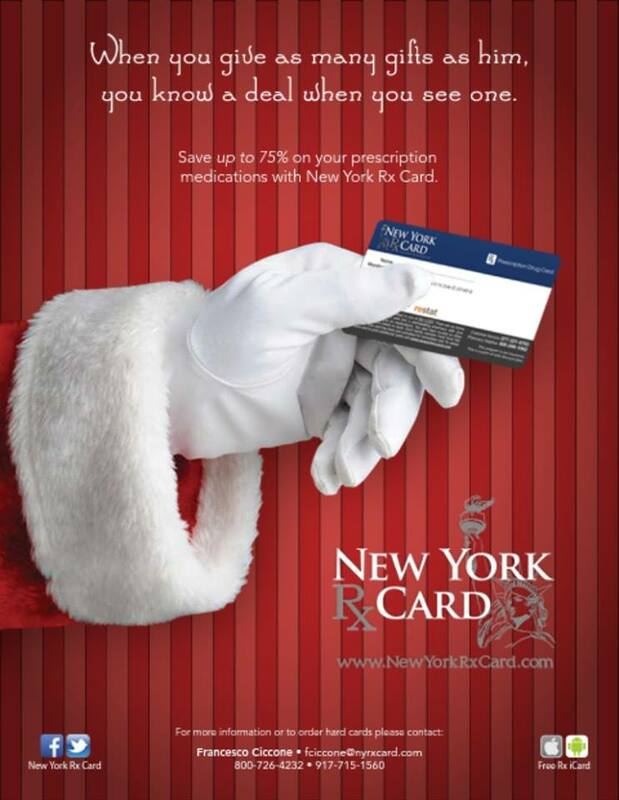 Visit NY RX Card on 7/14/2018! Free For Everyone. All residents are eligible to get pharmacy discounts through this program. The program can be used to supplement most health insurance plans including Health Savings Accounts (HSA) and High Deductible Plans. It can also be used as a Medicare Part D supplement by providing discounts on non-covered drugs. No Restrictions. There are no enrollment forms, no age or income requirements, no waiting periods, no eligibility required, no exclusions, covers pre-existing conditions, no claim forms to file, no annual or lifetime limits. Lowest Price. This program has Lowest Rx Price Logic to guarantee that you get the best pricing on prescriptions (Card holders pay the lower of a discount off Average Wholesale Price-AWP, discount off MAC Pricing, or Pharmacy Promotional/Retail price). You can save up to 75% on your medications (average savings are roughly 30%)! Medications. The program includes discounts on brand and generic medications, open formulary so that all medications are eligible for discounts. Accepted Everywhere. The Discount Prescription Card is pre-activated and accepted at over 68,000 pharmacies around the country including most major chains. Confidential. No personal information is required to get a card. 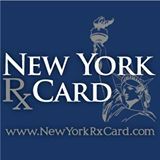 As a resident of New York, you and your family have access to a statewide Prescription Assistance Program (PAP). Create and print your FREE discount prescription drug card coupon below. 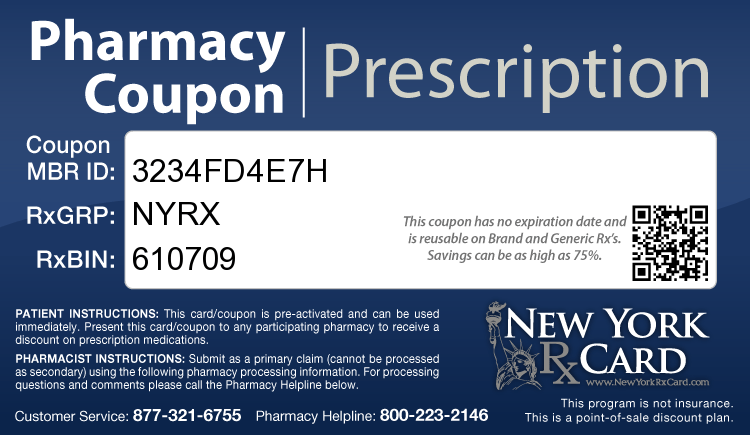 This pharmacy coupon card will provide you with Rx medication savings of up to 75%at more than 68,000 pharmacies across the country includingCVS/pharmacy, Duane Reade, A&P, Hannaford, Kinney, Kmart, Stop and Shop, Target, Tops, Walgreens, Walmart, Wegmans, and many more. You can create as many coupons as you need. We encourage you to create and send to friends and family members via one of the many available options. This Coupon/Card is pre-activated and can be used immediately! Tastemakers Africa is disrupting the narrative on Africa, one experience at a time. We connect travelers who want to go beyond safaris with vetted local insiders who host them on curated experiences. Our platform is currently live in Accra, Cape Town, and Johannesburg. Check out Creative Memorable Events! My name is Shelia and I absolutely love the broad themes of Event Planning. From small to large events, I offer the one most important criteria for all my engagements that is… INTEGRITY. In business since December 2016 as a professional, the services we offered to clients are: planning children parties, retirement parties, graduation parties, holiday celebration parties, baby showers, special birthday parties, etc. to name a few. The company currently is a team of 3 full time staff, with collaboration from several vendors offering services based on the clients needs. I offer a free consultation to all my clients as an introduction and to discuss the type of event requested and the services C.M.E. renders. No one event is the same and there are no cookie cutter decisions made from C.M.E. staff. From decorating a end table … To decorating a grand table, C.M.E. will do the job! My services are to offer my clients the ease of planning their events. A relation between you and C.M.E. is to make your memories special, to take care of your logistics, decorating, securing a venue spot, and set up, just to name a few of the many tasks to have a great event. Contact me to receive a initial free consultation about what your expectations are. Planning your little ones party can be a fun task if you let a pro handle the details. C.M.E Services will do just that for you. Call us and we will be happy to tell you all about the services we offer. Baby showers done at C.M.E can be whatever extravaganza you wish it to be, just leave it to our team to leave you and your guest with the WOW effect! . Need balloons with all the designs, colors, different dimensions, characters, etc. C.M.E. can offer just what you are looking for several designs to choose from. Contact us and let us know what you are looking for. Creative Memorable Events planning services stands out because of the truly personal touches provided. My Event Planning business is a young business, which offers the experience to each client as a long time acquaintance. Creative Memorable Events formerly known as SMAK are the initials of special names in my life. Event planning is my passion which I enjoy along with the satisfaction shared from my clients. I am able to work the needs of the client and offer ideas that yields a WOW response. Although I am fairly new entering the field of Event Planning, my services are comparable to other professionals in the business. My integrity, my attention to details, my compassion, and my competitive rates are part of the many things I enjoy about my services which I offered.